High Wycombe, Bucks, HP15 6XQ. 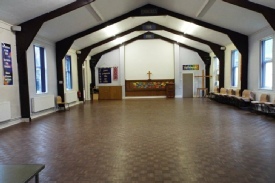 Services in the Church Centre usually occur in the morning. For times and frequency, see here. NB: Times and Days may vary. Events in bold are those run by the church. * Hired and run by external interests. 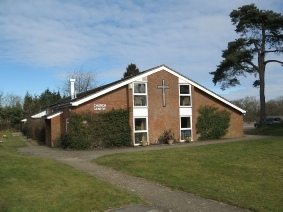 Our Church Centre is a busy place, and hosts various church and general activities, but there are still some free times in some rooms that can also be booked by external groups, subject to approval. We have a PA system and induction loops which can be used under supervision. 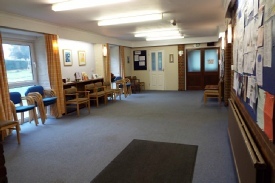 Ground floor rooms have independent access points and each has toilet facilities. The Workshop also hosts a free Lending Library for members of our fellowship. MAIN HALL [ 156m2 ] plus Kitchen. WORKSHOP [ 37m2 ] plus Kitchen. 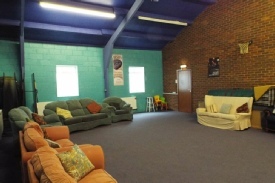 YOUTH ZONE [ 63m2 ].